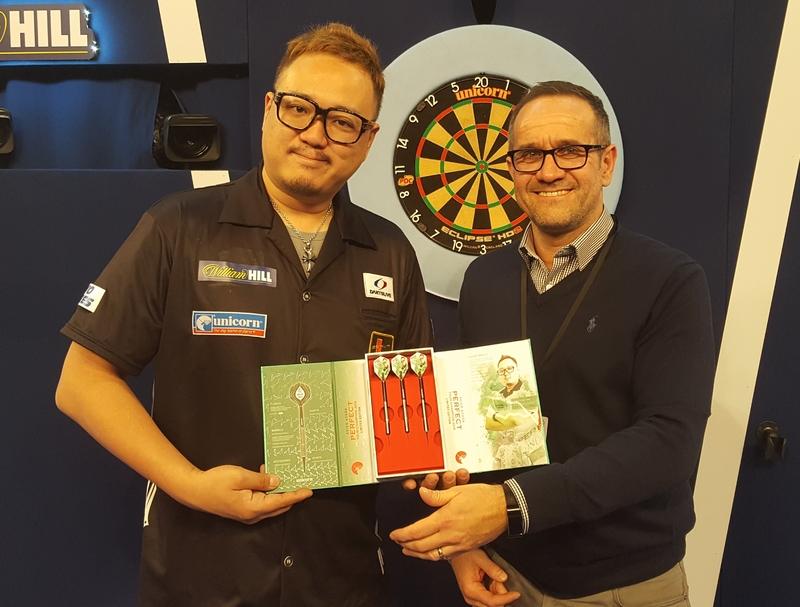 Team Unicorn star Seigo Asada was presented with a special Limited Edition set of darts at the William Hill World Darts Championship yesterday, ahead of his dramatic 3-2 1st round comeback victory over Krysztof Ratajski. The presentation was made on stage at Alexandra Palace by Unicorn Production Director Lee Parker. Japan's no.1 player Asada, was crowned Perfect Tour champion for 2018 with events to spare and to mark the fantastic achievement, 500 sets of Limited Edition darts have been manufactured by Unicorn for sale in Asia. The 500 sets made were sequentially numbered, manufactured to Seigos exact barrel design and coated with an eye catching green titanium finish. The special set presented to Seigo was engraved for him as the champion set, which will now take pride of place back in his homeland. Asada will be next in action at the World Championship, when he takes on fellow Team Unicorn star James Wade in an exciting 2nd round clash later today.